The hunt for the killer lures Lindsay out of her jurisdiction and Lindsay’s friends in the Women’s Murder Club are concerned that she’s taking the crimes too much to heart. But with lives on the line, Lindsay can’t stop herself from following the case into ever more terrifying terrain – even though the killer could cost her everything. 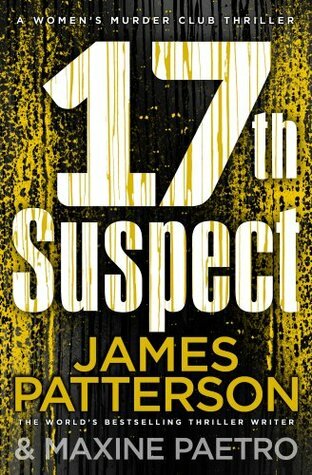 This is the seventeenth in the Women's Murder Club series (I've read them all). Though it is part of a series, it does work as a stand alone. There are four members of the Women's Murder Club ... Lindsay, Cindy, Claire and Yuki, though the focus in this book is on Lindsay and Yuki. Cindy and Claire are barely there, except when they meet for a couple meals. Lindsay is a detective with the San Francisco Police Department. She and her husband, Joe, are the parents of a young daughter. Joe is recovering from an injury (incurred in the last book) so is currently a stay-at-home dad. Lindsay is approached by Millie, a homeless woman, who tells her that others in her community are getting murdered but the police in that jurisdiction don't care. Millie asks Lindsay to help, which causes some tension with the police officers who are assigned to the cases. In the meantime, Lindsay isn't feeling well is concerned that she may be pregnant, something she's not sure she wants. Marc has gone to the police to say that he was raped by his boss and he has a video to prove it. Yuki is the DA assigned to this case and she's determined to bring Marc's boss down for what she did. I liked the writing style of this book and thought it went at a good pace. I liked the short choppy chapters. I thought the stories were okay, though the ending of one was pretty predictable and the other one ended abruptly and I would have liked more info on the "why" (not enough closure for me, I guess). The point of view shifted ... it was first person perspective when the focus was on Lindsay and third person perspective when the focus was on others such as Yuki and the killer of the homeless. As a head's up, there is swearing and violence.